I can’t believe there is anyone hiking the A.T. who hasn’t heard of “Leave No Trace”–probably the 2nd most overused phrase after “Hike Your Own Hike”. While we’re all likely getting a bit tired of hearing BOTH messages, the LNT one really matters–and here’s how it affects your hiking experience. 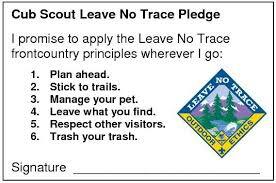 Leave No Trace(™) is an independent non-profit organization created in 1993 by outdoor industry and sporting trade associations, NOLS (National Outdoor Leadership School), nonprofit organizations, outdoor manufacturers and federal land management agencies. It grew from a program initially created by the USDA Forest Service in the 60’s to emphasize wilderness ethics and sustainable backcountry travel and camping. In 2000 it formally partnered with a variety of federal agencies, including the National Park Service and US Forest Service (primary land managers for the A.T.). LNT provides training for both managers and visitors to the A.T. and other federally owned parks, forests and recreation areas. Recently, ATC entered into a partnership with LNT to provide Master Trainer certification programs. 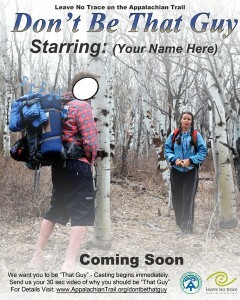 Fifteen years ago, when I first heard about “Leave No Trace”, I thought the whole idea was way overdone. How can one actually inhabit an environment without leaving some indication that you had been there? Were we expected to be some sort of super ninja, gliding through the backcountry in black slippers? Of course you are going to leave a trace. I was pretty turned off by the whole idea of someone telling me how to behave. 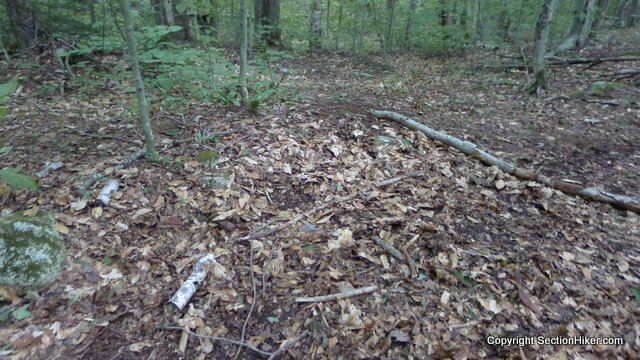 However, as I reluctantly learned more about what was going on (and also gained more experience on the A.T.–both as a hiker and volunteer) I began to see how important it was to give trail visitors the tools to conduct themselves well in the woods. 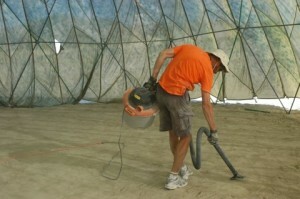 As a young Boy Scout in the 1960’s it was all about adapting the environment to suit our needs. 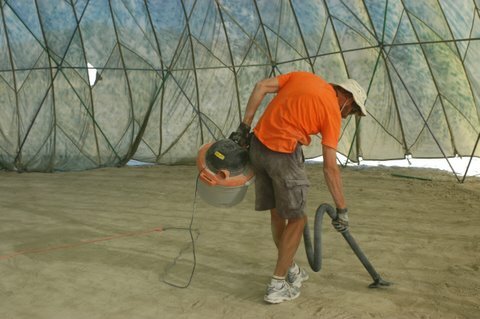 We were trained in techniques to find and create a campsite in a previously undisturbed area. We were taught to dig a trench around our tent to keep water out, create a cook table by cutting saplings and lashing them together and cooked all our meals on an open fire. 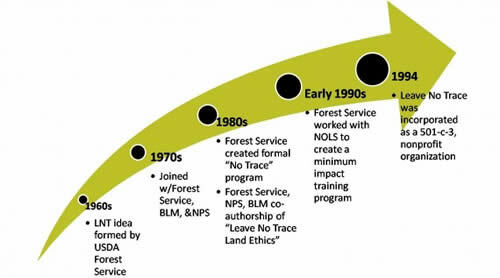 50 years later, this ethic lingers on–I’m still running into people who think it’s their duty as responsible outdoor visitors to “improve” a campsite for the next user. Fortunately the BSA and most of the rest of us understand now that we should do more to meet nature on its own terms. That we are the Guest, not the Owner. As I made my own mental transition to Guest status, I found the Seven LNT Principles a good way to organize my thinking and manage my own presence in the backcountry. 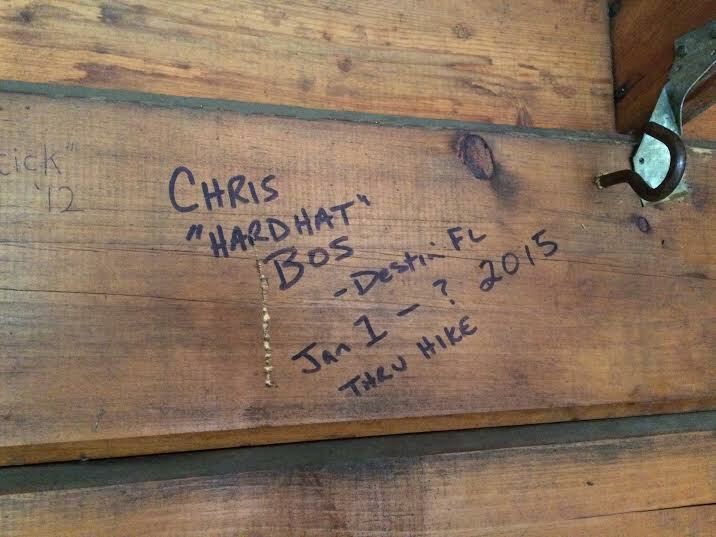 Now, as a 15-year volunteer for the Trail, I can really see how even one person’s poorly considered actions can have a long-lasting (decades in some cases) effect on what other hikers experience. If you are a reader of this article, I must assume you believe the A.T. holds some intrinsic value, that it has/had/will have a positive effect on your life. That you believe that others should have an AT experience of similar quality. 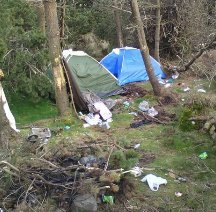 So, continuing that thought…Should an AT experience include blown-out campsites, trash filled fire rings and “gardens” of TP behind the shelter? We could consider those as “part of the experience”–but really? Is that experience inevitable–or even valuable? 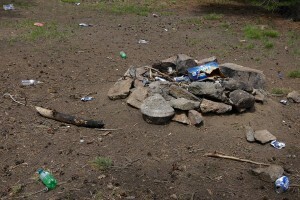 Choices made by an individual do affect others–particularly in the micro-community of the A.T. : A hiker sees “burnt” food packaging in a fire ring–obviously left by a previous user. When it’s her turn to decide (and yes, it is a decision) about what to do with her empty Liptons pack–there’s an example sitting right in front of her. “What’s one more?”. “I’m hiking on in the morning, I’ll never see this place again”. “Someone else will take care of it.” The next day, another hiker sees two packs in the fire ring. The same thoughts pass through his head–except now there’s even more evidence that this is an OK thing to do. Human nature being what it is, not every hiker will make the right decision–but if only one hiker says “hey, that’s not cool”, the chain of poor choices is broken for that moment. A small decision has cascading consequences, either positive or negative. As much as we may consider an A.T. hike as an experience in individuality of action, it’s not. We are a community, and like other communities, the actions of one affect the many. On the Trail, as lengthy as it is, our community is small, our built environment is relatively minimal, and everyone uses the same spaces. Small actions have big effects, both physically and socially. Anecdotally, there certainly is an increase in reports of questionable choices by visitors to the Trail–some recent blog posts to this site (here and here) and Facebook have certainly added to concerns about the seeming lack of care by A.T. thru hikers–but thrus are a vast minority of trail and campsite users. It’s easy to toss collective blame out there. Yes, there is an “elite” vibe from thru-hikers (particularly by the time they get up my way)–but with very few exceptions they are efficient, thoughtful travelers. But, the long distance hiking community can exert considerable peer pressure to limit poor behavior within their own community–and by example, the behavior of others on the Trail. Probably not what you had in mind when you started your hike–but few things teach better than a good example. 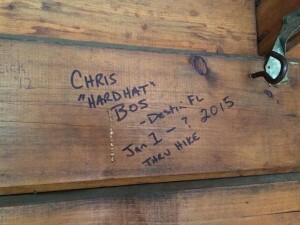 Whether you are a thru hiker or not, people notice what you do, so do it right. With great power comes great responsibility. Use it wisely. Lead by example. 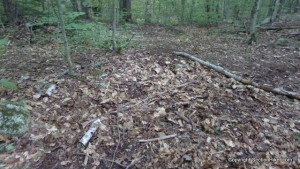 I’ve noticed that a couple of bloggers at Appalachian trails have mentioned in their blogs building fire rings at stealth campsites. This certainly isn’t consistent with the rules as I understand them. Are blogs edited? Surely someone can point out that this practice is against the rules. 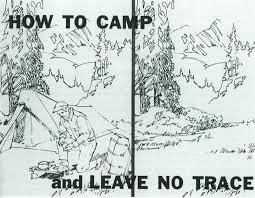 Fantastic article, and – from this new BSA Leave No Trace trainer – thanks for including the Scouting component. Scouts are some of the heaviest users of outdoor recreation facilities, and their change in approach as you note surely makes a huge difference in how places like the AT are used…and preserved.